I have some Brown spools to show this week. 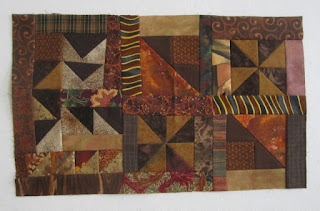 I did some at retreat while sewing other things as this is a leaders and enders project. 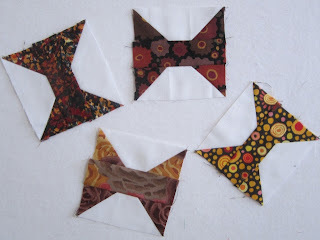 I am trying to do this like a charm project also and not have two fabric repeat, so doing each colour by the month helps. A few of my favorite brown fabrics. I have added this post to Soscrappy. 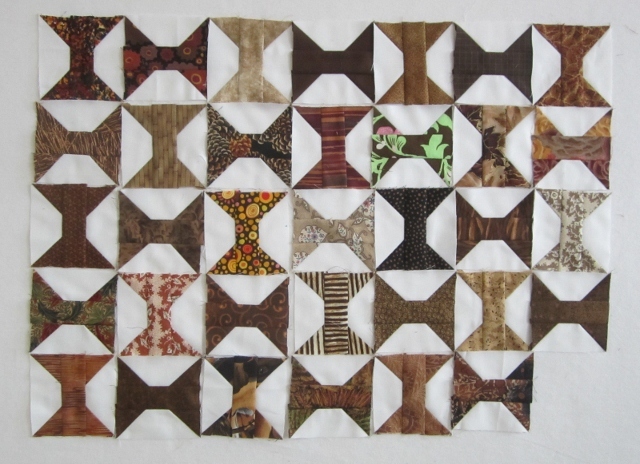 I also got a chunk of brown Poverty Piecing done too. I had to made some desserts today. My husband is hosting a party for 32 people tonight. I am in change of dessert. I am making Lemon squares. 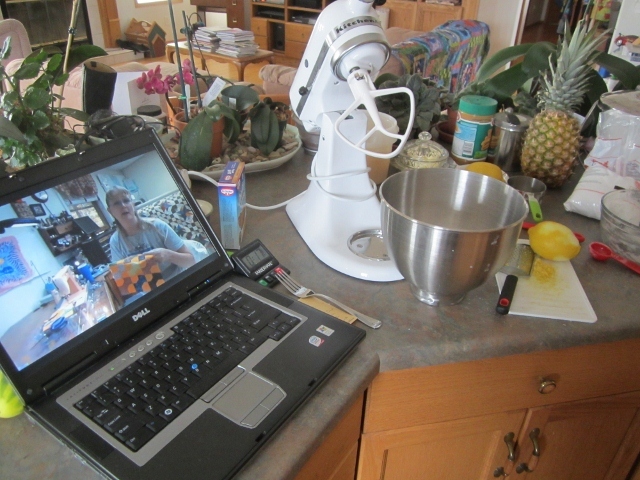 I wanted to watch Bonnie's Quilt Cam too so set it up next to the mixer. Lex joins me by sitting next to the hand towel. It is the best place not far from the heat vent and the lest likely place to be stepped on. 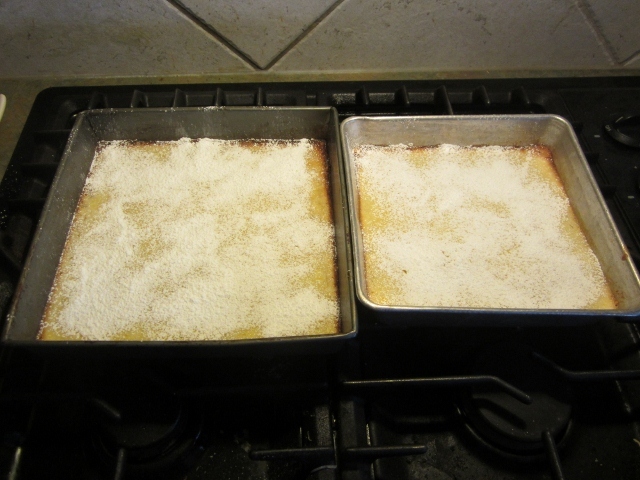 Lemon squares out of the oven. 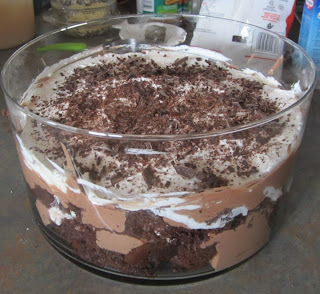 Chocolate cake and chocolate mousse dessert in layers. I also made a double pan of chocolate Brownies. So lots of Browns happening around here. Wish us Luck with the big crowd of people. I hope everyone comes. 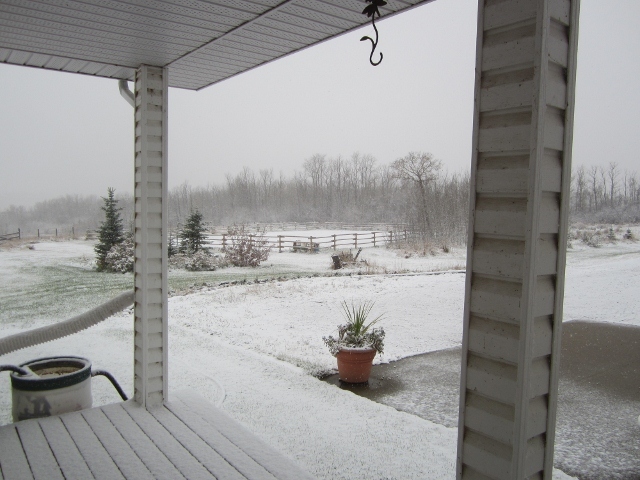 Here is a photo out the front door. We have snow. It is melting on the roads and sidewalks, so driving is not bad. Lemon squares - how yummy - I am sure they will be a hit- It looks like you have more snow than here in the city- it has melted off already- hopefully it will melt away for you too. More snow than we had here...but isn't baking comforting when the weather turns? P.s. Love those wee bow-ties! Love the shots of snow! Your little spools are wonderful. Any of those yummy looking desserts left? I'll take some of the chocolate mousse please. Oh my goodness - so many things to appreciate in your post! Your Spoolin' Around blocks look terrific. I've only finished a handful of them as leader enders this month. I hope I get some more made before the month ends! Lovely desserts! I love anything chocolate, but I also happen to be a fan of lemon squares. Mmmm! Lex sounds so well-behaved in the kitchen. 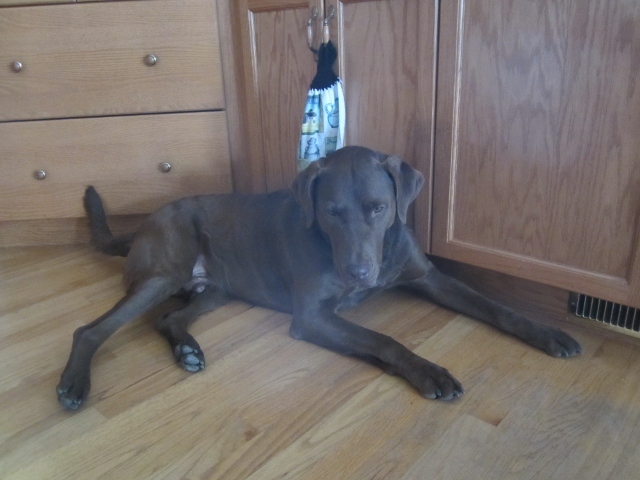 My dogs always want to be right underfoot when I am cooking. Hoping for dropped goodies, I suppose! And snow already?! I can't imagine it! Last night was about the coolest overnight temp we've had yet - 55 degrees (13 C). I'm happy to have a break from our summer heat, but I'm not ready for snow! Your little spools are looking great. 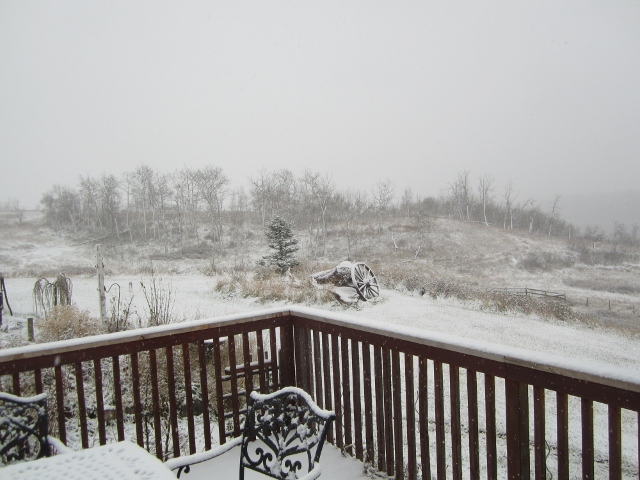 Oh My -- I can't believe you have snow already. I am certainly NOT ready for that. We are still getting great Indian summer weather 65 - high 70's. Maybe even into the 80s by next week. Your desserts really look yummy. I'd better get to bed or I'll be snacking real soon. Love your cute little brown spools. Yummy deserts! 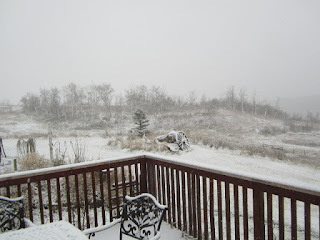 Difficult to imagine snow already. 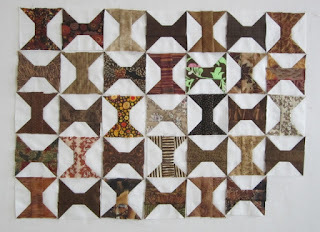 I love the idea of making a rainbow scrappy spool quilt as leaders/enders each month. That would be a fun one for 2013!